The following article was written by Hannah Riordan. Imperial ratio in a foreign country? You bet! The dry season in the region of Tabora, western Tanzania can last up to 8 months, often leaving the locals with no other option than to buy water or collect it from nearby wells. This inconvenient situation results in large amount of infections by water-borne diseases. In 2009, an ambitious team of engineering undergraduates (including some of our very own department!) was sent out to the area to construct sustainable rainwater storage tanks using local resources, while engaging the community. After arriving in Dar Es Salaam, we knew the most gruelling part of the trip was still ahead of us. Tabora is located in western Tanzania; as such a 15-hour bus journey across the country would be our first authentic Tanzanian experience. The final 200 miles of the road had not been laid with tarmac yet, as such my personal initial plan of a 15-hour nap was replaced by desperately clinging onto a cage of chickens for 4 shaky hours. We finally arrived safely in Queen of Peace Girls’ Secondary School in the town of Nzega, where our project was to take place. 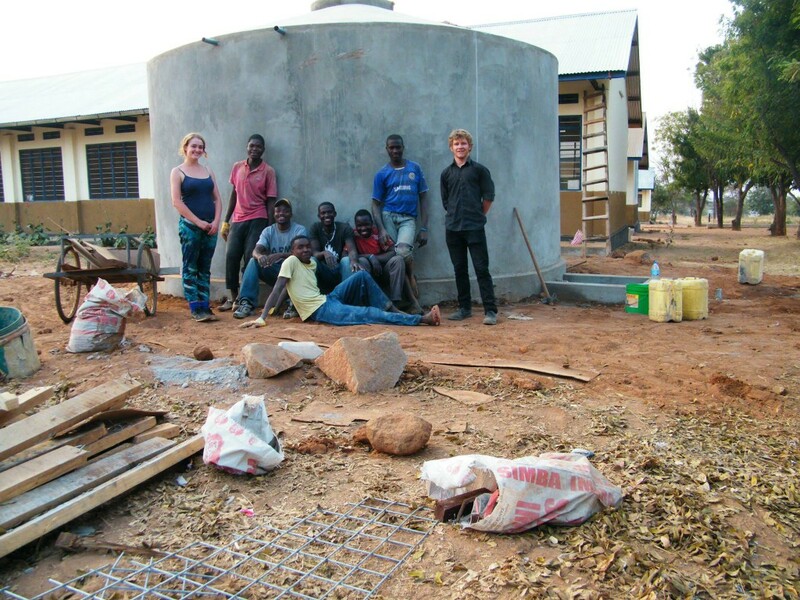 The plan was to construct a new 50,000L tank above ground as well as completing repair works to the school’s own storage tanks. Local manual labourers were employed from the town for the project. The design also consisted of an added first-flush system and tap inserted at the base in order to flush out sediment heavy rainwater during the first storms of the season and prevent soil from contaminating the water. Each cemented layer was kept wet by splashing it with water. The local high temperatures and drought make concrete structures in the region extremely susceptible to plastic shrinkage cracking (boom: civil engineering reference!). ‘Watering the tanks’ became a daily ritual for us. One unfortunate person would climb inside the humid structures to splash the walls. One of them was covered knee-deep in water. Luckily, there was never a risk of feeling lonely in an underground tank when you have cockroaches the size of a human foot to keep you company (seriously though, nothing with more than 4 feet should be this big). ‘The Training of Trainers (TOT) scheme’ was held simultaneously in the nearby village of Igoko and comprised of jar construction and a micro-finance scheme. A 3-week course was held in consultation with our hired technician. 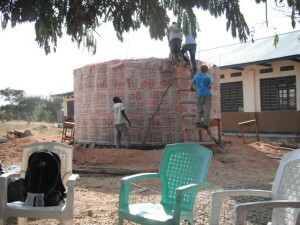 The participants came from all over the village with varying construction experience. At the end of the course, the participants picked up basic construction skills and were confident in building jars with a capacity of around 150L. We helped and supervised the female participants. There is a significant female participation in the course, and supporting some all-important GIRL-POWER had a very positive effect on all. We also promoted ownership to ensure sustainability and worked closely with the church leaders so that they know how to maintain the tanks. In addition, the team initiated a microfinance talk to introduce the concept of microcredit, in order to overcome the financial difficulty faced by the participants in building more jars. Along with facing the local fauna, building tanks, a lot of community engagement was also achieved by tutoring the students in the village. This was a great way of getting dialogue going and finding out about the local curriculum. We also felt secretly proud of putting our own high school maths skills to some non-Imperial use. On Sunday nights the students of Queen of Peace hosted a talent show in the assembly hall, a chance for us to sing, dance and relax while getting to know the excellent local music industry. Occasionally we’d go to the local pub to grab a quick pint of Safari beer (East Africa’s finest!) with our workers. On other days we’d go for some well-earned rice and kuku (chicken) with the sisters. These ladies were without a doubt the most laid-back gang of Roman Catholic sisters we had ever met. One of the highlights of our trip, along with the thrilling satisfaction of seeing our project come to completion, was the safari trip at the end of the project. This was encouraged by our workers and the sisters as they felt we could not leave their beautiful country without seeing the stunning natural reservations. 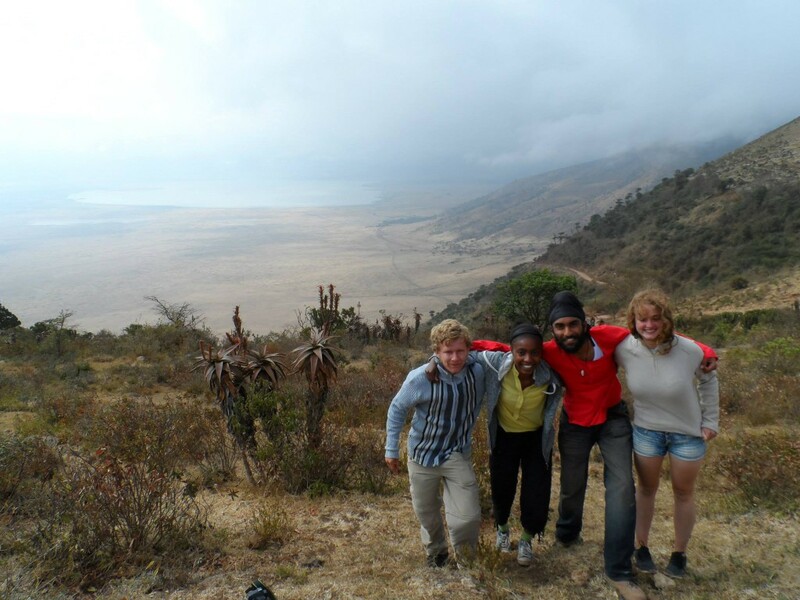 We set off to Arusha early on a Saturday Morning and spent the next 2 days exploring the beautiful Ngorongoro crater. The views were breath-taking and elephants, flamingos, hippos, lions, zebras and baboons were all successfully sighted!